Irish counties – from Fermanagh to Louth – an introduction. 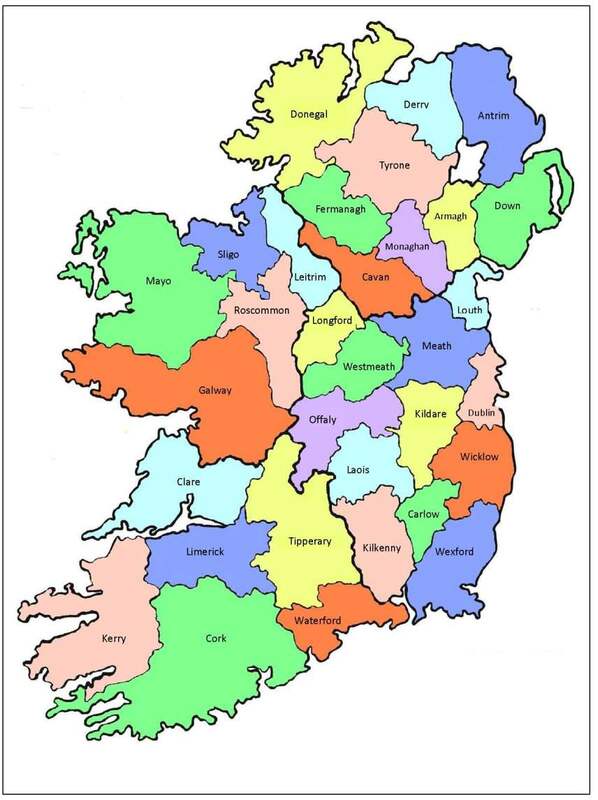 Click image to open a larger view of the 32 Irish counties. Below are brief details of the Irish counties that begin with the letters E to L, that is from Fermanagh to Louth. Based on 1890 records, the most common surnames in co Fermanagh include Maguire, McManus, Dolan, McGovern, Johnston, McHugh. It is the only one of the Northern Irish counties to NOT have a border with Lough Neagh, the biggest freshwater lake in either the UK or Ireland. This is more than made up for by Upper and Lower Lough Erne which cover one third of the county and which explain why Fermanagh is known as Lakeland County. The survey for Griffith's Valuation was conducted in 1862. 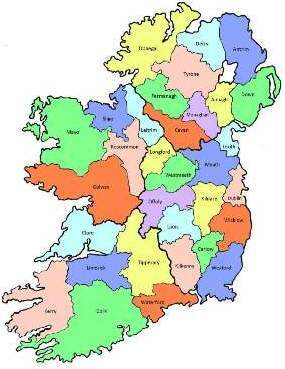 In Irish, the county is called Gaillimh meaning 'stony', describing a river. Galway is one of the five Irish counties that make up Connaught province. Within its borders is the wild and beautiful region of Connemara, and Lough Corrib, the largest lake in the Republic. The three Aran Islands, the original home of Aran sweaters, are in Galway Bay. The county town, Galway City, is the third largest in the Republic. Part of the Gaeltacht (Irish-speaking areas), it is renowned for its traditional culture, especially Irish dancing and Irish music. People from Galway are referred to (especially in sporting connotations) as the Tribesmen or the Herring Chokers. According to 1890 records, the most common surnames associated with co. Galway include Kelly, Burke, Conneely, Joyce, McDonagh, Walsh, Fahy, Mannion, Flaherty, Murphy, Connolly and Keane. Griffith's Valuation was carried out in 1855. In Irish, Kerry is known as Ciarraí, meaning the Descendants of the tribe of Ciar. County Kerry, Ireland's very own Kingdom, is in Munster province and is world famous for the fabulous scenery of the Lakes of Killarney. While many tourists stay in hotels in the principal towns of Tralee, Killarney and Kenmare, a significant proportion opt to stay in quintessentially Irish country cottges overlooking mountains, lakes or sea. The town of Dingle, on Dingle Bay, is the most westerly of Ireland's mainland, and another hotspot for Irish tourism. Surnames associated with Kerry, based on 1890 records, include Sullivan, Connor, Shea, Murphy, McCarthy, Moriarty, Fitzgerald, Griffin, Connell, Brosnan, Foley and Leary. Richard Griffith assessed Kerry for his Valuation in 1855. In Irish, the county is called Cill Dara, meaning Church of the oak). Located within Leinster province, it is the flatest of all Irish counties, a feature that makes it perfect for horse racing; the Irish Stud and the Curragh, where the Irish Derby is held, are both in Kildare. Close by are century-old Japanese Gardens. The county also contains most of the Bog of Allen, the world's largest peat bog. 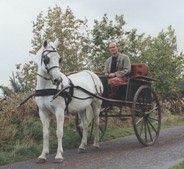 Locals bear the nickname of Lilywhites, on account of the pure white background of Kildare's flag, while their county is often referred to as the Thoroughbred County. Surnames associated with co. Kildare, based on 1890 records, include Kelly, Murphy, Dunne, Byrne, Nolan, Connor, Smith, Farrell, Ryan. The survey of Kildare for Griffith's Valuation was carried out in 1851. In Irish, Kilkenny is called Cill Chainnigh, meaning Church of St Canice who established a monastery in the county town of the same name in the 6th century. A Church of Ireland cathedral now occupies the site; completed in 1285, it is the second-largest medieval church in Ireland. The county is in Leinster province but used to be part of the old Gaelic kingdom of Ossory, an independent buffer state between Leinster and Munster. While the county is often referred to as the Marble County, on account of its blue limestone quarrying industry, Kilkenny folk are nicknamed the Cats. Surnames associated with co. Kilkenny, based on 1890 records, include Brennan, Walsh, Murphy, Ryan, Carroll, Byrne, Butler, Maher and Dunne. Richard Griffith surveyed Kilkenny for his Valuation in 1849-50. The word Laois (pronounced 'leash' is the same in English and Irish. In Irish it means Lughaidh Laeighseach, a chieftain. You may come across many genealogical and historical records referring to Laois as Queen's County, named after the English Queen Mary Tudor who was responsible for 'planting' this area with her supporters in 1556. Its county town is Portlaoise. Grand houses and gardens worth visiting include Abbeyleix, Roundwood and Emo Court. Mountmellick is also interesting for having been founded in the 17th century by Quakers and growing prosperous on the cotton, Irish linen and wool industries. Surnames associated with co. Laois, based on 1890 records, include Dunne, Delaney, Conroy, Lalor, Phelan and Fitzpatrick. In Irish, the county is called Liatroim, meaning Grey ridge, which explains why it is often referred to as the Ridge County. It is divided in two by Lough Allen and has countless lakes within and on its borders. Leitrim is also sometimes referred to as O'Rourke County because the family of that name used to be the principal sept. This was when the county was known as West Breffni. Along with several other Irish counties, it was 'shired' in about 1585. Today, Leitrim is a quiet county, inhabited mainly by small-scale farmers. In 1890, the county's most common names were Kelly, Reynolds, Flynn, McLoughlin, McHugh and Rooney. In Irish, the name of the county is Luimneach, meaning Barren spot of land. Despite its name, it is a mainly farming community, but it also has hundreds of historical monuments, especially romantic castle ruins, dotted about its landscape. The county, in Munster province, is often referred to as the Treaty County, in memory of a 1691 treaty between the supporters of William of Orange and the Jacobites. 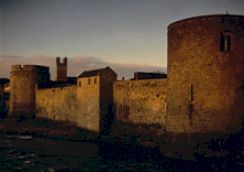 Its principal city is Limerick, which was founded in AD922. The city's inhabitants are called Shannonsiders, in reference to the River Shannon that opens into the Atlantic to the north. Surnames associated with co. Limerick, based on 1890 records, include Ryan, O'Brien, Fitzgerald, Sullivan, Hayes, Walsh, Collins, O'Connell and Murphy. Limerick was surveyed for Griffith's Valuation in 1853. Is one of the Northern Irish counties. See Derry. In Irish, the county is called Longfort, meaning Castle or Encampment. It is a flat, Midlands county, with plenty of lakes and trees, and was once known as Annaly. It was ruled over by the O'Farrells. Today, Longford has the smallest population of any county in Ireland. Locals are referred to as the Slashers and a sizeable proportion of them work in agriculture or related industries. Surnames associated with co. Longford, based on 1890 records, include Reilly, Farrell, Kiernan, Kelly, Donohoe and Murphy. In Irish, the county is called Lù. It is the smallest of Irish counties, hence its nickname: the Wee County. It was extensively settled by the Anglo-Normans who built some fascinating castles and monasteries. Mellifont Abbey, buit in 1142, is a beautiful but ruined example. More recently, Louth's population has grown enormously thanks to its proximity and relative ease of commute to Dublin. Its principal towns are Dundalk and Drogheda. Common surnames in Louth, according to 1890 records, were Byrne, Kelly, Murphy, Smith, Clarke, Duffy, McArdle and Reilly.